Dee Brown, HR Advisor for Medical Mutual’s HR|Experts program, can help you with any human resources issue, from wage and hour situations to leadership development. Join us on January 15th as Dee discusses the essential points of operating successful medical practice personnel management. Plenty of time will also be devoted to answering your various HR questions. Dee Brown is the HR Advisor for the Medical Mutual HR|Experts’ program. With significant HR experience, Dee is a dedicated, on-call resource for all Medical Mutual members. HR|Experts is a benefit of membership in Medical Mutual, provided at no additional cost. Dee has been an HR professional and consultant for more than 30 years, with business experience in both the private and public sectors. She spent the last decade running her own HR consulting firm, Brown Human Resources Consulting. Over the course of her career, Dee has worked with small, mid-size, and large global companies, such as MCI, ReEnergy Holdings, Glaxo, CCME, and BASF. Dee provides sound advice and guidance through email, phone calls, and live chat. She monitors trends and current events and provides resource guides, compliance e-alerts, quarterly newsletters, and monthly webinars to provide practical advice on HR topics related to the business of running a medical practice. She is based in Raleigh but serves all Medical Mutual members. This webinar is complimentary for NCMGMA members and $50 for non-members. Space is limited so make sure to register early! After you register, you will receive an emailed confirmation with webinar and phone-in instructions. Continuing education credit may be granted through your professional organization (MGMA, PAHCOM, AHIMA, etc.). Please self-submit for these organizations. 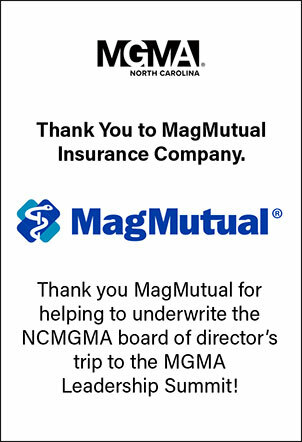 For questions or more information please contact the NCMGMA offices at info@ncmgm.org.